City authorities in Hamilton, Ontario, recently decided that the circle-A is ‘hate material’. 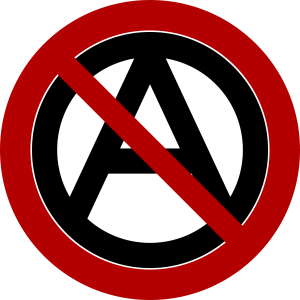 A local Anarchist Social centre was ordered to remove the famous anarchist symbol from its window, using a bylaw usually reserved for issues around improper maintenance. 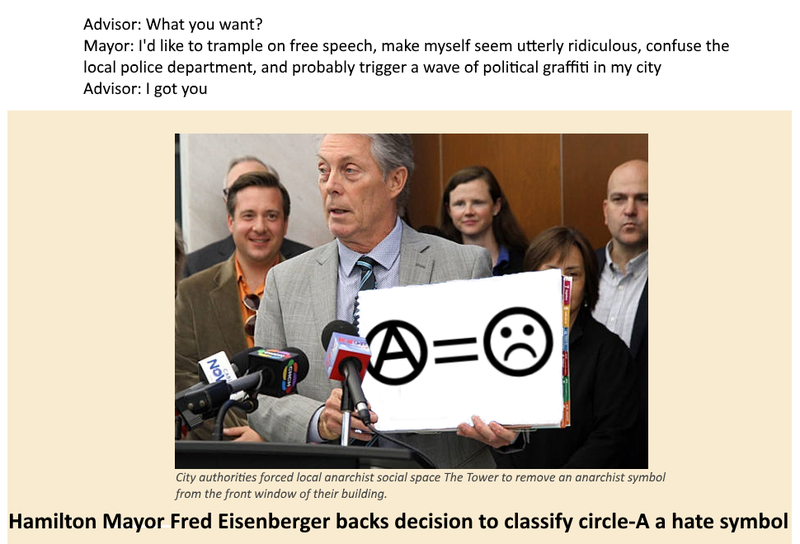 The city’s Mayor was quick to state his support for the actions, announcing his belief that the circle-a is a ‘hate symbol’. This went against statements made by the local police, and even against statements that would later be made by the Mayor (yes, the same mayor). If you think this sounds like it’s getting rather confused, you’re not wrong. We should probably take you back to the beginning of this saga. 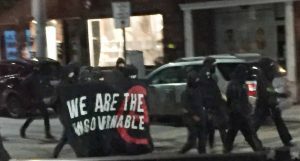 In March, during the evening of Hamilton’s anarchist bookfair, a group of anti-gentrification activists marched down Locke Street behind a banner reading ‘we are the ungovernable’. The banner also featured the dreaded circle A. They caused an estimated $100,000 of damage to the street hailed as the cities ‘gentrification success story’ before disappearing into the night. This was just the latest, and boldest, act taken against the cities gentrifiers. With no arrests on the night, and no solid leads, authorities were left embarrassed and looking for someone to blame. Police attention quickly turned to the bookfair itself, with suspected organisers raided by a swat team, who broke into their home, threw a stun grenade, dragged them out of bed, trashed their rooms, seized computers, phones and books, and arrested one of them on ‘conspiracy’ charges. Focus was also on the most visible part of the local anarchist scene, The Tower, a social and events space. The Tower maintained a policy of unapologetic support for the actions of anyone fighting the class war from the side of the oppressed, refusing to play into the hands of the ‘good anarchist/bad anarchist’ narrative. Along with a barrage of threats from the far right came two actual attacks on The Tower, resulting in a smashed front window. Which is where the latest act of pettiness from the City Authorities comes in. 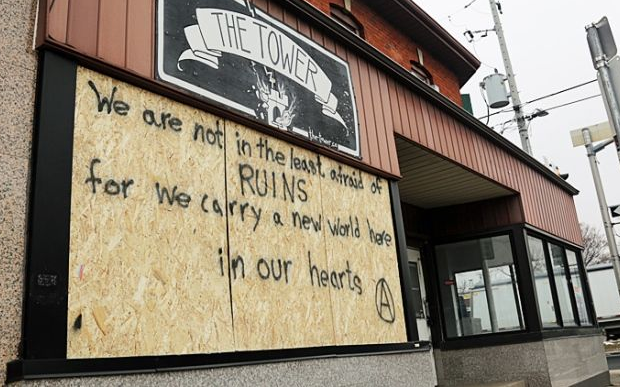 In the most apt use of the famous Durruti quote we’ve seen, The Tower sprayed the plywood board covering their newly broken window with the phrase ‘We are not in the least afraid of ruins, for we carry a new world here in our hearts Ⓐ‘ . 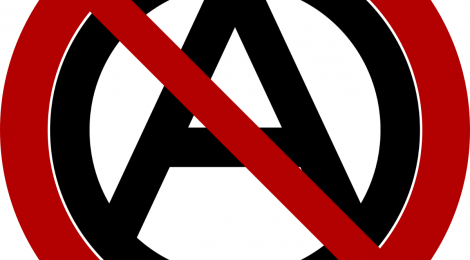 A ‘property standards order’ was issued to remove the offending enclosed letter, with a spokesperson later telling the press “The anarchist symbol is considered hate material by the City of Hamilton and Hamilton Police Services and as such, must be removed”. Only… is it? Even the Hamilton Police Department distanced themselves from the claim, saying “It does not meet the threshold of a hate crime”, and they were the ones who sent a swat team after the local anarchists! Experts on both hate symbols and free speech were quick to weigh in and defend the symbols use. Quite a few pointed out anarchists are most often found fighting against those that spread hatred based on the criteria listed in hate crime laws. The response from most people, and not just the anarchists, was a resounding ‘WTF?’. Hamilton’s Mayor stepped in to answer this question, saying “Certainly the anarchists that have locally presented themselves have done things that would be considered to be inappropriate, so if you tie the two of them together, I would say that’s a symbol of destruction and mayhem and causing a crisis to a particular area, is that hateful? I think it is”. This shows a willingness to support some pretty totalitarian practices. Is associating with people who are ‘considered to be inappropriate’ enough to warrant state censorship? Apparently so. It’s nice to be reminded that the freedom offered by liberal democracies is only ever freedom to do as you’re told! Still, it seems Mayor Eisenberger wasn’t quite ready to put himself in the firing line for his beliefs. Perhaps it was the talk of a constitutional legal case which triggered his change of heart, or maybe he was worried about how unpopular it was making him, could be he started to realise that an action like this might lead to MORE anarchist graffiti in his city – anarchists not being known for doing as they’re told. His current line is “it is clear the anarchy symbol is not a hate symbol and efforts are being undertaken to immediately update staff training”. We can only hope the staff training includes information on syndicalist struggle in the work place, and some good introductory texts (we’re quite partial to Errico Malatesta’s At the Cafe) . If not, there’s always the next Hamilton Anarchist Bookfair. Whilst this bit of state interference was relatively harmless, the political conspiracy charges against the arrested anarchist Cedar aren’t. If you can spare some cash to help support Cedar and their legal defence, you can donate via Hamilton Anarchist Support.